The April snow and rain in Philadelphia is not stopping Rocky. Actor Sylvester Stallone posted a video of himself on the set of 'Creed 2' outside his motorhome trailer. According to Stallone, it's the first day of filming. 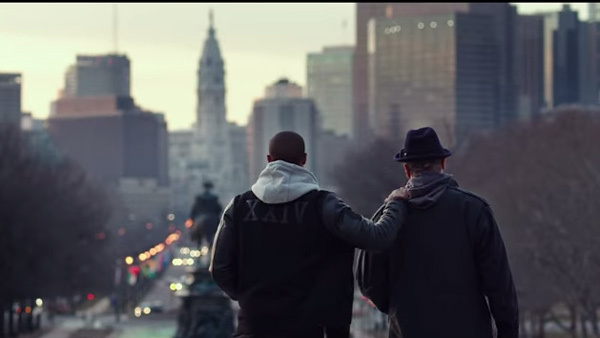 "Well, here it is folks, on a beautiful Philadelphia day, but what's important is this is the first day of 'Creed 2,'" Stallone said. "I think Rocky is in this, so I'm ready to enjoy the day." Sylvester Stallone has a message for the Philadelphia Eagles: "Keep punching Philly!" Stallone recalls having a motor home on set 42 years ago, but back then it was in the back of a van. "Progress is being made," Stallone says. He then invites the viewer to take a look inside his trailer. "Get out of the rain," he says. However, once inside, like a quick left hook, he says "Keep punching" and blocks the camera's view, quickly ending the sneak peek behind the scenes of the latest 'Rocky' movie. He captioned the video with "A very exciting day. The actors and production team have been waiting a long time for this film to start so ladies and gentlemen get ready to watch the fists start to fly!" 'Creed 2' is scheduled to be released in theaters in November. November 6, 2015: It's been nearly 40 years since the first Rocky movie hit theaters and put Philadelphia in the national spotlight.